An Arapaho Hills home, photo courtesy of milehimodern.com. Located just south of Denver, the Arapahoe Acres neighborhood was built between 1949 and 1957 as a collaboration between Edward Hawkins and Eugene Sternberg (who were clearly inspired by Frank Lloyd Wright). In southwest Denver, Harvey Park is the location of Cliff May’s tract ranch homes, some of the first pre-fabricated houses in the city. A small concentration of midcentury custom homes built between 1957 and 1964 can be found Arapahoe Hills, located in Littleton. Besides these significant residential areas, you may also spot some Googie-style neon signs lighting up commercial areas in downtown Denver. With 1,254 homes built between 1953 and 1962, Glenbrook Valley is Houston’s largest collection of midcentury and ranch houses. The city also boasts the work of MCM architects such as Frank Lloyd Wright’s 1954 Thaxton House, located in the Bunker Hill Village. John Chase, the first African-American architect in the state, built a home in Riverside Terrace for himself and his family in 1959. 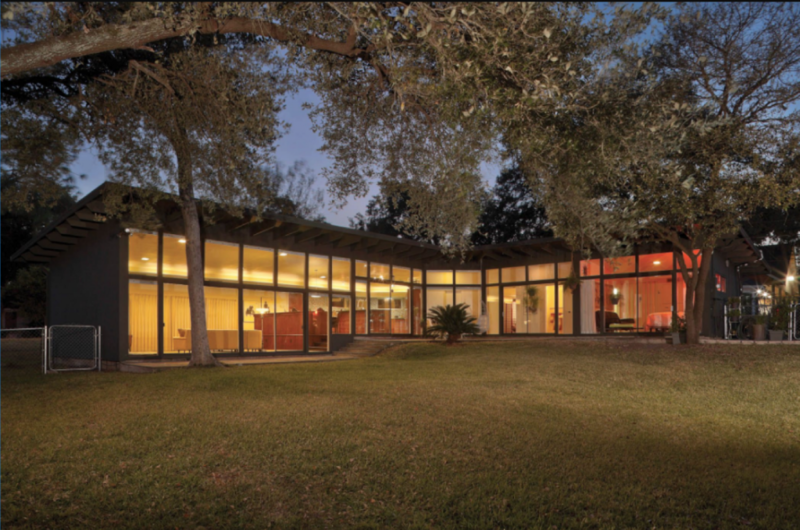 To learn more about Houston homes, history, and architects, check out Houston Mod. 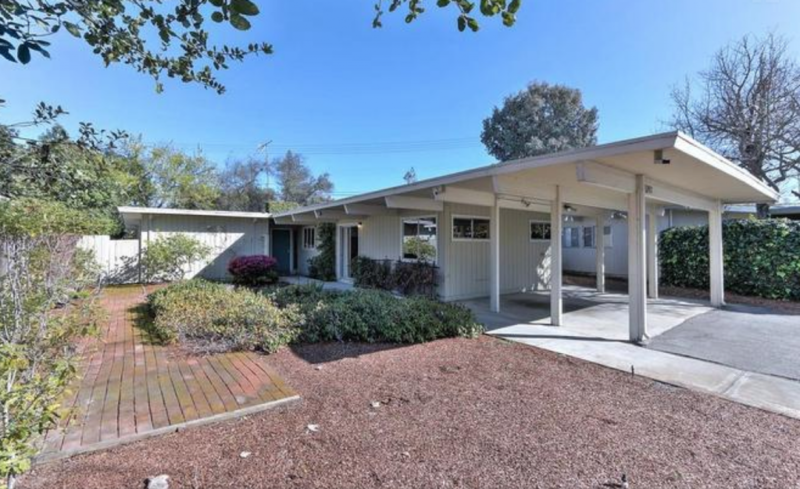 This 1952 Eichler found in the Fairmeadow neighborhood has characteristic flat rooflines and high ceilings. Photo courtesy of redfin.com. With distinctive floor-to-ceiling windows, clerestory windows, and minimal indoor/outdoor transitions, Eichler homes are still abundantly found in Palo Alto neighborhoods. Green Gables and Greenmeadow, two of the earliest and most intact Eichler neighborhoods, were added to the National Register of Historic places in 2005. With 243 single-story Eichler homes, Greenmeadow was designed in 1954 and features the lovingly named “Eichler Pool”. Royal Manor neighborhood, completed in 1958, has 200 Eichler homes which are somewhat larger than earlier models. Eichler also built in several Northern California areas including Marin County, Sacramento, and San Jose. This 1967 Rummer ranch found in Oak Hills (Beaverton) features an atrium, characteristic to the style. Photo by Jim Brown. Unique to the Pacific Northwest, the Northwest Regional Style can be found throughout the Portland area. These houses have a characteristic rustic look that blends seamlessly into their outdoor surroundings. Often featuring wood framed construction, low-slung silhouettes, and unpainted roofs, this style can also be called Westcoast Contemporary. Architect Robert Rummer brought another distinct style to the area. These “Rummer Homes,” found in Beaverton, feature vaulted ceilings, post and beam construction, and atriums to allow an indoor/outdoor connection. Both Portland styles often feature the floor to ceiling windows we all know and love in MCM homes. 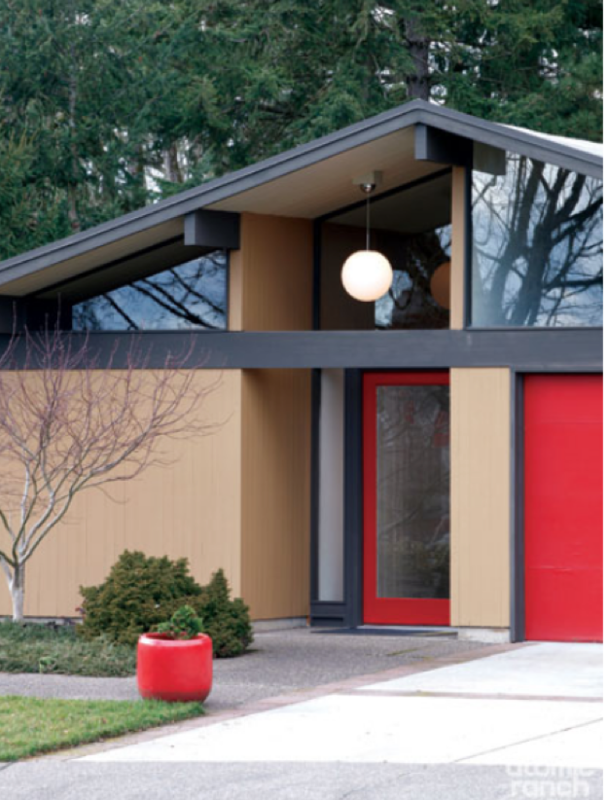 To learn more about these styles or to find your own Portland home, visit Modern Homes Portland and Restore Oregon. Want to see MCM eye-candy in Las Vegas? Look no further than the famous Googie-style neon sign that welcomes you to the city! Make sure to visit the La Concha Visitors Center—once a lobby for the La Concha motel designed by Paul R. Williams in 1961—to gaze upon the unique parabolic structure that also doubles as an entrance to the Neon Museum’s Boneyard. 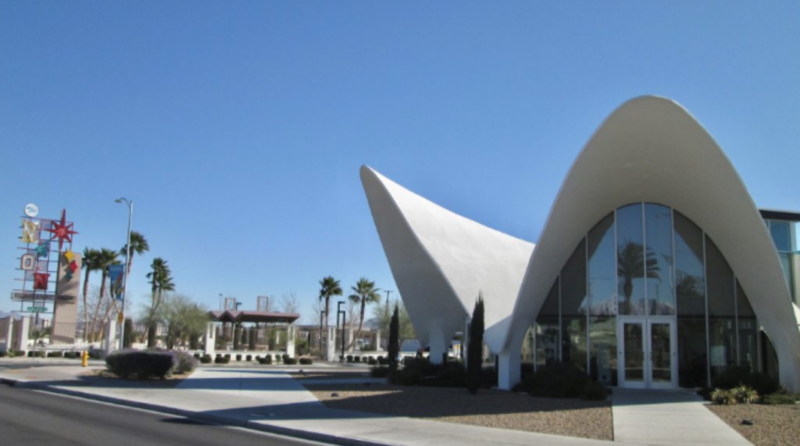 More Googie-goodness can be found at the Guardian Angel Cathedral, a geometric and angular 1963 church also built by Paul R. Williams. Las Vegas has some significant residential areas as well, including Paradise Palms, a community with hundreds of tract homes by Dan Palmer and William Krisel. For more on Las Vegas’ midcentury homes and history, visit Nevada Preservation Foundation. The high-rise skyline of bustling Chicago offers a sleeker, more efficient style of midcentury modern buildings. Architect Bertrand Goldberg, a student of Mies van der Rohe, built Marina City in 1967. Also called the “Corncob Towers,” this functioning city within a city is still standing today. 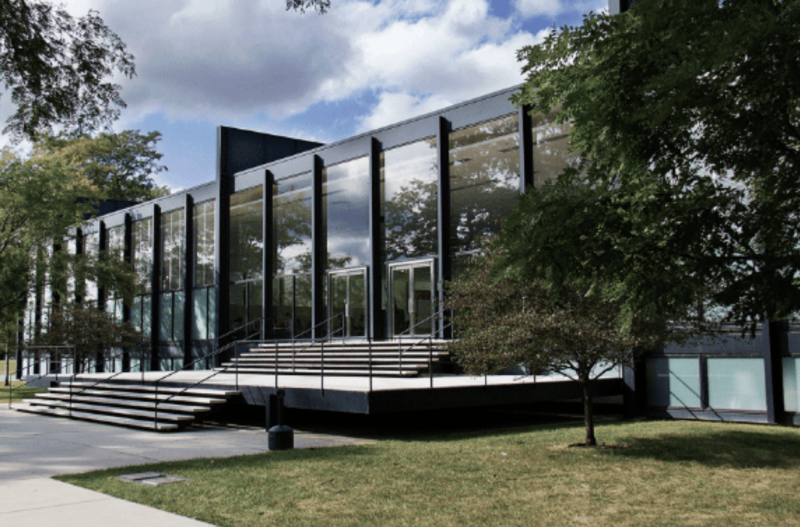 Mies van der Rohe’s own work can be seen at the Illinois Institute for Technology (ITT) campus, perhaps most notably in the sleek S.R. Crown Hall building. According to Modern Chicago Homes, the suburbs are where to find residential midcentury treasures. 24 homes by architect brothers Keck & Keck can be found in Forest Crest, a small division of Glencoe, and South suburbs are spotted with houses by Edward Humrich and Edward Dart. To learn more about these residential gems, visit Modern Chicago Homes. 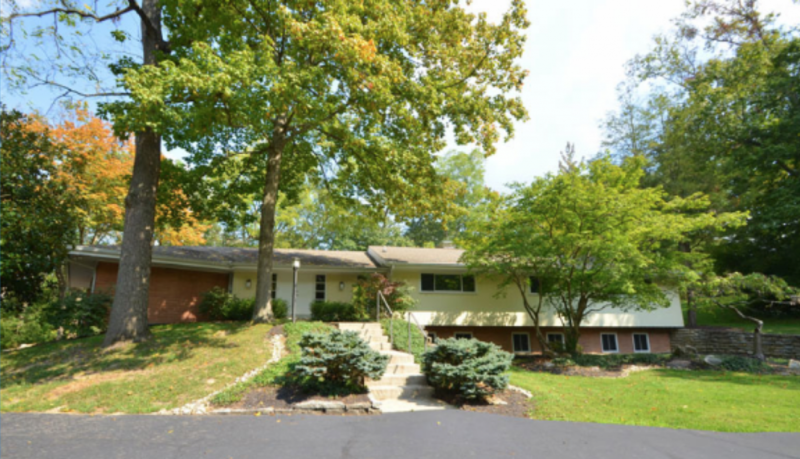 This 1963 Warren Holly home is located in Amberly Village, just outside of Cincinnati. Photo by Susan Rissover. Speckled among the Gothic revival and large Victorian houses of the Cincinnati suburbs, you can also find some midcentury homes. Amberly Village, located in Hyde Park, has a large selection of MCM homes with a location that also allows easy access to the downtown area and major highways. The Frederick and Harriet Rauh House, built in 1938 by Modernist architect John Becker, has recently been restored and awarded a Design Award of Excellence from DocomomoUS. And we must mention that Charlie Harper, a prolific modernist artist specializing in wildlife, graduated from the Cincinnati Art Academy and has deep roots in the city. 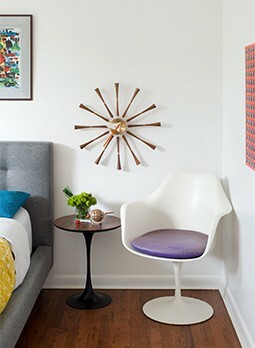 For more, visit Cincinnati Modern. 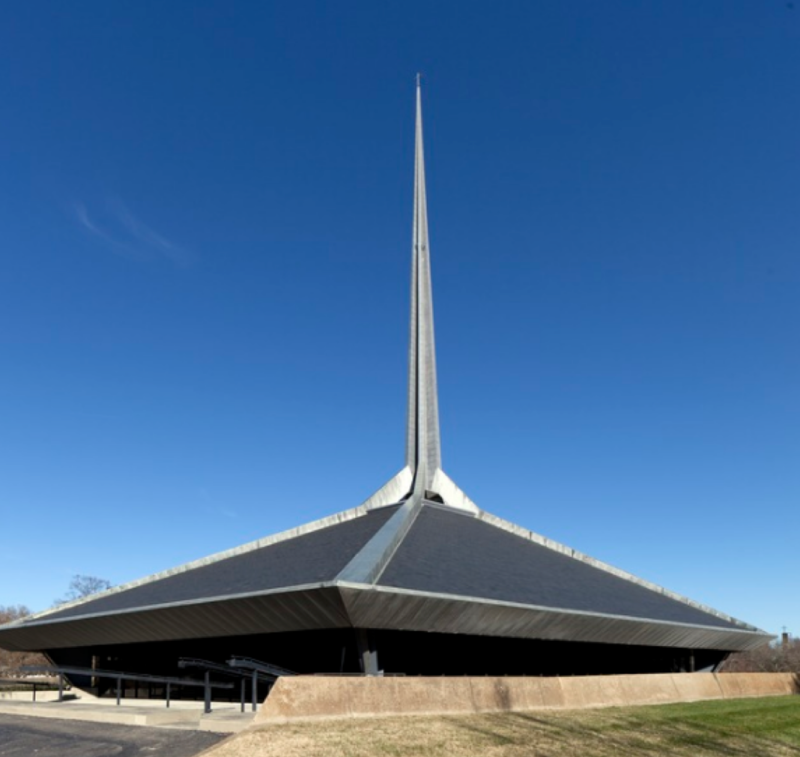 Eero Saarinen designed several significant structures in Columbus including the North Christian Church, the last design before his death. Photo found at flickr.com from Hans Kundnani. The small city of Columbus, Indiana offers some of the boldest designs in Midcentury Modern architecture, thanks to industrialist and architecture patron J. Irwin Miller. Eero Saarinen was brought in by Miller to design a home for he and his wife. This striking house, finished in 1957, features a lush sunken lounge area for gathering. You can now tour the home and gardens which was given to the Indianapolis Museum of Art after the couple’s death. Also built by Saarinen is the North Christian Church which is now a National Historic landmark. The crisp sloping building was Saarinen’s last design before his passing in 1961—the plans were carried out by successors and completed in 1964. Similar to other communities across America, Boise experienced a surge in population and size following World War II. Neighborhoods were built on the outskirts of busy cities that offered young middle-class families a safe home with fenced-in back yards, convenient garages, and nearby proximity to schools and modern shopping centers. 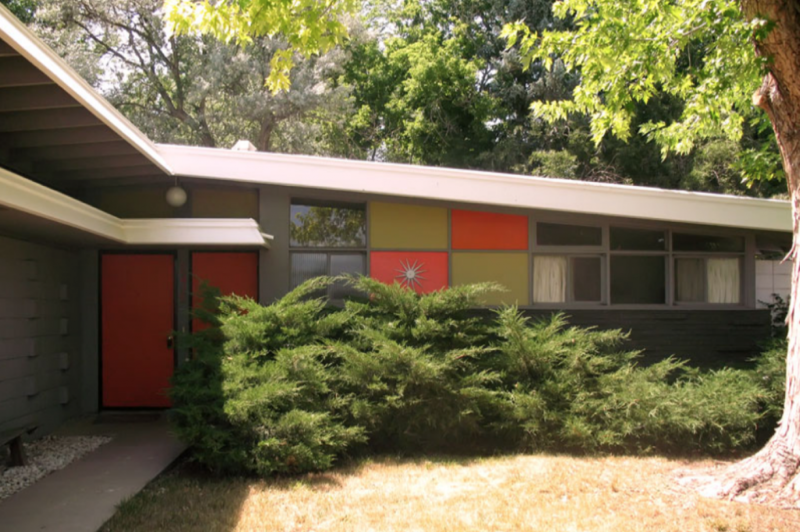 Many of these communities, along with other stand-alone midcentury gems can still be found in Boise today. Check out their informative and fun “Idaho Modern Field Guide” and learn more at Idaho Modern.